Commercials from the 80s, especially commercials for children, tended to be a little insane. 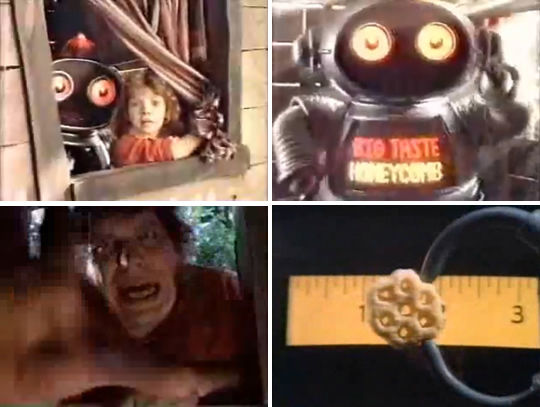 Take, for example, the Honeycomb Hideout commercials for Honeycomb cereal. Each commercial goes like this: a bunch of children (and in the later commercials, a cereal robot) are hanging out in a shack in the woods. 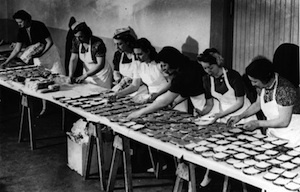 All of a sudden, some sort of menacing grownup shows up — a ninja, an Amazon queen, or Andre the Giant — and demands a "big taste." They offer this villain some Honeycombs, and measure it using a measuring tape the to prove that it is, indeed, rather large. Then they sing a jingle: "Honeycomb's big, yeah yeah yeah! It's not small, no no no! Honeycomb's got a big big taste! Big big crunch with a big big taste!" The commercials are absurd and kind of awesome, and much less irritating that the current "Craving Creature" commercials Honeycombs runs now, which have kids turning into weird rodents after they run out of cereal.